South Korea’s electronics giant Samsung Electronics is spurring its efforts to develop the next generation-semiconductor production process by investing 779 million euro ($975 million) in Dutch-based ASML, the world`s leading providers of lithography systems for the semiconductor industry. Samsung announced Monday that it will join ASML’s Co-investment program for innovation and commit to contribute 276 million euro to ASML’s research and development (R&D) of next generation lithography technologies over the next five years. Samsung is also expecting to buy a three percent equity stake in ASML, worth 503 million euro. ASML has recently decided to sell off its 25 percent stake and proposed the sell-off plans to three global IT companies including US-based Intel, Samsung and Taiwan-based TSMC. Among them, Intel agreed to acquire a 15 percent stake from ASML and TSMC decided to invest in ASML’s shares. As smartphones and tablet computers become more popular, more parents are using them to babysit their children, with plenty of apps available to entertain infants, toddlers and pre-school kids. “A smartphone and for-kids apps are a must for our family at restaurants, in the car or often at home,” said Kim Sun-min. Her 28-month-old daughter is a frantic fan of Pororo, the main character of TV animation series “Pororo the Little Penguin.” Whenever she gets bored and starts being difficult, Kim runs an app on her smartphone that streams episodes of the cartoon series and hands it over to her. It keeps her engaged for at least an hour, she said. Many parents have relied on TVs and computers to entertain their bored children. Now, in the era of mobile digital devices, they are discovering smartphones’ similar ability as a babysitter. 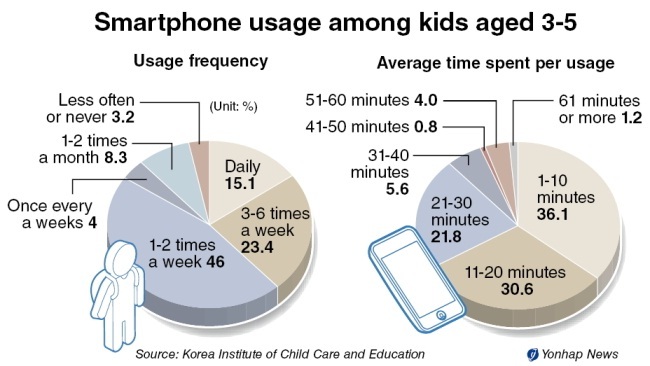 There is no study yet in Korea about smartphone watching by children under the age of 3. But a survey came out last week revealing the trend in the 3-5 year age group. The Korea Institute of Child Care and Education surveyed 252 parents with children aged 3-5 in Seoul and Gyeonggi Province and found that 15.1 percent let their children play with smartphones every day. 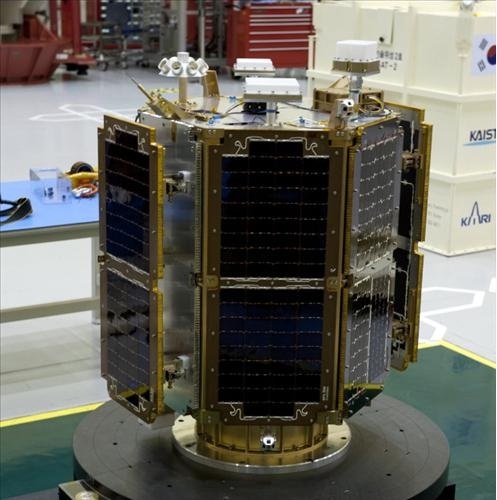 A picture of the Science & Technology Satellite-2C that will be launched into orbit in October (Photo courtesy of KAIST). The Science and Technology Satellite-2C (STSAT-2C) will be revealed to the public Friday in a pre-shipment ceremony to be held at the Korea Advanced Institute of Science and Technology (KAIST) in Daejeon, 160 kilometers south of Seoul, according to the Ministry of Education, Science and Technology. The satellite, indigenously developed by KAIST, is the third of its kind as its two predecessors — STSAT-2A and STSAT-2B — were lost in failed attempts to launch the country’s first space vehicles in August 2009 and June 2010. A new and improved Korea Space Launch Vehicle-1, also known as Naro-1, is scheduled to be launched in October, with the specific launch date to be set later. The country’s first space rocket was developed jointly with Russia. For full article see Yonhap News. The chief of Korea’s aerospace agency expressed optimism ahead of the launch of the nation’s first space vehicle slated for October. “Everything is under control and I’m sure we’ll have a successful launch in October,” Kim Seung-jo, president of Korea Aerospace Research Institute, said in an interview with The Korea Herald. Korea failed in its previous two attempts to launch its own rocket in 2009 and 2010. KARI has learned crucial lessons from the experiences. The KSLV-1, known as Naro-1, is a two-stage rocket built in cooperation with Russia. Russia’s Khrunichev Space Research designed and manufactured the lower part and KARI developed the upper part. The Constitutional Court ruled Thursday that the Information Communications Law requiring the use of real names online was unconstitutional, setting the stage for scrapping the policy which was implemented in 2007. The court made a unanimous decision that the law violated people’s freedom of speech. A petition filed by “Internet Media Today,” an online media company, among others in 2010, claimed that the law was discriminatory. Until now, websites with more than 100,000 visitors per day required users to authenticate their identities by entering their resident ID numbers when they used portals or other sites. The policy was set up in an effort to curb malicious comments online that had led, in cases, to people committing suicide. For full article see Korea Times. It remains to be seen whether Future generations of the iPhone could have flexible organic light emitting diode (OLED) displays that can bend and twist. LG Display, a major supplier of flat-screens to Apple, confirmed Thursday it would be able to mass produce flexible OLED displays from the second-half of next year. Han Sang-beom, LG Display’s CEO, didn’t reveal any names when talking about the orders the company has been receiving. However, it’s difficult to presume LG Display attempting such a big jump in technologies without commitment from Apple, its largest customer for screens. It’s hard to predict when smartphones with rubbery touch screens will ever be commercialized, but Han says at least LG Display’s screens will be there by the end of 2013. Korea has been increasing its research and development projects in the fields of information and technology and biotechnology, spearheaded by 30 state-run agencies over the last three years, according to the National Science & Technology Commission. R&D investment in software, renewable batteries and displays accounted for 19.4 percent of the total last year, up from 18.3 percent in 2009, the commission reported on Sunday. Cloud computing is one of the hottest innovations in the information technology industry, including in Korea, seen by many as the next best way to store and manage data. However, industry observers are concerned that it may threaten digital property rights and security of information. Cloud computing uses servers rather than hardware to store information. Proponents of the method argue that it allows companies or individuals to manage more data better and faster by putting it on a larger virtual server with a bigger capacity. American technology giants Apple, Microsoft and Google are all investing heavily in developing clouds while Korean firms have shown a keen interest in adapting the new method to their systems. A group of South Korean scientists has developed a new material for a secondary or rechargeable battery that can be fully recharged in just a matter of minutes, the science ministry said Monday. The development of such a battery could significantly raise the popularity of electric vehicles whose lithium-ion batteries currently take hours to recharge, according to the Ministry of Education, Science and Technology. Conventional batteries use only powdered nanoparticle materials to form a dense, multi-layered structure that can store and give off energy. The new battery, on the other hand, uses the same type of nanoparticle materials that are first resolved in a solution that contains graphite, which later is carbonized to form a dense network of conductors all throughout the electrodes of the battery, the ministry said. As a result, all energy-holding particles of the new battery start recharging simultaneously while the same particles in conventional batteries begin recharging in order from the outermost particles to the innermost.